ROME — A quake triggered by Mount Etna’s ongoing eruption jolted eastern Sicily before dawn Wednesday, slightly injuring 10 people and prompting frightened Italian villagers to flee their homes. The quake struck north of Catania, the largest city in the eastern part of the Mediterranean island, but no injuries or damages were reported there. Italy’s national seismology institute said it registered a magnitude of 4.8 and occurred at a relatively shallow depth, 1 kilometer (0.6 mile) under the mountain’s surface. The temblor damaged some rural homes, including structures that had been abandoned years ago, toppled a Madonna statue in a church in the town of Santa Venerina and opened up cracks on a highway, which was closed for inspection, Rai state radio said. One 80-year-old man was safely extracted from the rubble of his home, the Italian news agency ANSA said. A woman told state radio that a heavy armoire in her home had toppled over, trapping her sister, who was then safely pulled out by her father. In another house, a ceiling collapsed. 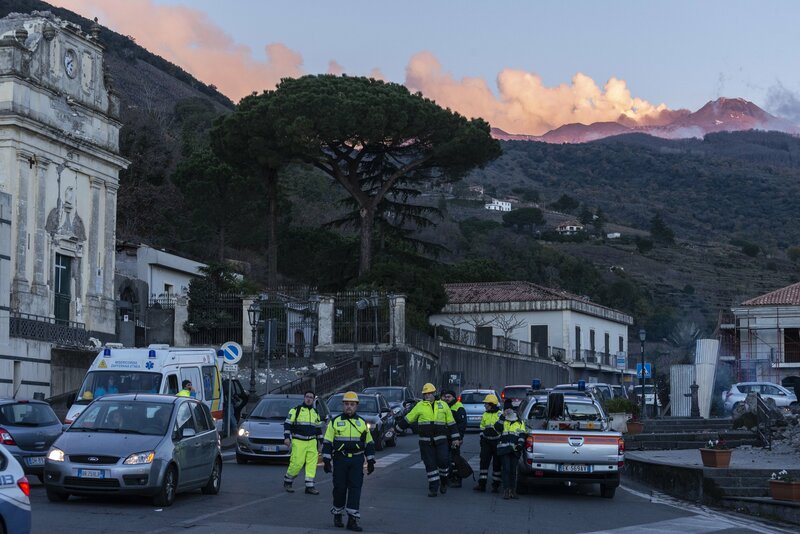 “Etna remains a dangerous volcano, and this country of ours is unfortunately fragile,” government undersecretary Vito Crimi said, adding there were no fatalities and 10 slight injuries. The quake was also felt in the upscale Sicilian resort town of Taormina. The Civil Protection agency said temporary shelters were being set up for people whose houses were damaged or who were too alarmed to return to their homes. In recent days, Etna’s latest eruption has been shooting volcanic ash, heavy smoke and lava stones into the air, coating roads and homes nearby with ash. A new fracture has opened near Etna’s southeast crater and lava has been flowing down an uninhabited slope. Etna, the largest of Italy’s three active volcanoes, has been particularly active since July.